The World Health Organization estimated that there are 600,000 new cases of head and neck cancers and 300,000 deaths each year worldwide. A careful diagnostic workup is necessary before treatment of head and neck carcinoma (HNC) through clinical evaluation, three-dimensional imaging, panendoscopy, and biopsy. Three-dimensional imaging modalities help to give proper staging to the lesion., Different imaging modalities used for this purpose are as follows: computed tomography (CT), contrast-enhanced CT, magnetic resonance imaging (MRI), diffusion-weighted (DW) sequences (DW MRI), ultrasonography (USG), USG-guided fine-needle aspiration cytology, positron emission tomography (PET)/CT, or a combination of these techniques. With the technological advancement, integration of two most effective imaging modalities PET and MRI has been introduced. PET scan is a highly sensitive modality and precisely shows distribution of radiopharmaceutical agent. On the other hand, MRI provides good spatial resolution, good soft tissue contrast, spectroscopy, dynamic acquisition of perfusion, and more. The data from MRI are not easily available for attenuation correction (AC).,, This leads to problem when PET is used to monitor therapy response because it limits quantification of PET data. Due to absorption or scattering out of radiation from detector's field of view, loss of detection of true coincidence events is called as attenuation. PET/MRI provides qualitative data only because it does not provide an attenuation map for ionizing radiation. Hence, PET data cannot be subjected to AC in this case. To get attenuation maps of MRI data, it has to be transformed into “quasi” CT data. The conventional MR pulse sequences are unable to show bone unequivocally, and it is a major challenge to use MRI data for AC of PET data. To solve this problem, PET/CT-MR sequential system is used; CT data in this system is available for PET/CT examination. The data in this approach is coregistered by hardware. The results from both systems can lead to some changes in data set because PET/CT and PET/MR are different in make and require 30 min difference to take scans. The difference in two scans timings can lead to difference in fluorodeoxyglucose (FDG) tissue distribution and related alterations in standard uptake value (SUV), leads to difficulty in comparison between two scans. Technically, it is complicated to combine PET/CT and MRI, but the information provided by these two modalities are compatible with each other. However, now software is available to combine data from both imaging modalities, and the first generation of PET/CT and MRI is available for clinical application. The scarcity of clinical studies makes it difficult to compare PET/MRI with PET/CT, DW MRI, or the combination of these modalities. The main purpose of this article is to present the use of PET/CT and MRI in HNC. PET/MRI can be taken with three approaches depending on the facilities available in the institution. The third method combines a whole body high-resolution MRI (including dedicated sequences) with whole body PET imaging. It is quite difficult to use this method clinically because of long scan time. Varoquaux et al. measured SUVs of sixty-six malignant lesions, one hundred and thirty-six benign lesions, and four hundred and seventy normal organs (region of interest). The whole body PET/MR and PET/CT scans were taken for all the patients. They found SUVmean and SUVmax significantly lower for PET/MR than PET/CT for benign and malignant lesions, metastatic lymph nodes (neck), bone marrow, and liver. SUVmax was specifically lower for spleen and background on PET/MR. There was no statistical difference for mediastinal metastatic lymph nodes, distant metastasis, and for normal organs (muscles, salivary glands, and lungs). In an another study by Wiesmüller et al., after an hour of radiotracers injection (FDG, F-ethyl-choline and Ga-DOTATATE), the first scan, i.e., a PET/CT was taken followed by hybrid PET/MR. All the patients underwent PET/MR after an average of 88 min. Lesion tracer uptakes value was calculated by SUVmax and SUVmean. The authors concluded that SUVmean was 11% and SUVmax 21% lower in PET/MR than PET/CT. Drzezga et al. assessed SUV on 63 lesions in 20 patients and on different anatomical regions. They observed significant lesser value of SUVmean and SUVmax on PET/MR than on PET/CT. The value of SUV could be affected by size of malignancy; bigger the tumor, more is the difference between SUVs recorded on PET/CT and PET/MRI. In our opinion, more research work is required to gain a better knowledge of differences in SUVs values. The three types of artifacts can hinder the examination through PET/MRI are (a) susceptibility artifacts (b) AC artifacts, and (c) miscoregistration artifacts. The different ferromagnetic substance in head and neck region such as dental restorations, dental implants, and osteosynthetic material can cause disturbance in magnetic field strength. The spatial distortion of surrounding anatomy due to dephasing of spin and frequency shift in tissues around ferromagnetic substance can cause bright and dark areas on MRI images. The area of artifact is directly proportional to the composition of ferromagnetic substance. The artifact is more evident at high-field strength, on gradient echo sequences, with long echo train length and DWI sequences. Due to this artifact, wrong air attenuation coefficient can be assigned to corresponding MRI sequence because this artifact can lead to a “blank” signal. This blank signal can underestimate SUVs value which can be compensated by manually filling the gap on AC maps., The artifacts due to dental implants and restorations can decrease SUVs by 20% in the dark streak artifacts and increase by 90% in bright streak artifacts region when compare to artifact-free area. The dental implant and restoration artifacts are more pronounced on CT imaging as compared to MRI. Due to the respiratory motion of chest and bodily movement of patient between two scans (PET and MRI), miscoregistration of data can occur. The diagnostic errors such as actual tumor localization, or its extension in deeper tissues can occur even with minor degree of miscoregistration and can affect tumor staging. Note: AC has already been discussed. Due to the scarcity of data, it is difficult to compare sensitivity, specificity, and reliability of PET/MRI in head and neck region. The present data set evaluates software fused PET and morphological MRI images taken on separate scanners. In a study by Nakamoto et al., total sixty-five consecutive patients were evaluated. Out of 65 patients, 48 were new cases, 15 patients had recurrent carcinoma, and 2 were diagnosed with metastatic cervical lymph nodes with unknown primaries. The morphological images of MRI were combined with FDG-PET images. On a patient-based analysis, the sensitivity for primary tumors was 98% for MRI, and 100% for PET/MRI fused images, 70% and 90%, respectively, for recurrent cases and 50% and 100% for second primary cancers. The sensitivity, specificity, and accuracy for metastasis to lymph node from PET/MRI were 85%, 92%, and 89%, respectively. This study concluded that PET/MRI is a beneficial modality to diagnose recurrent cases and second primary cancers. Huang et al. assessed PET/MRI software fusion, PET/CT, MRI, and CT images of 17 advanced buccal squamous cell carcinoma patients. 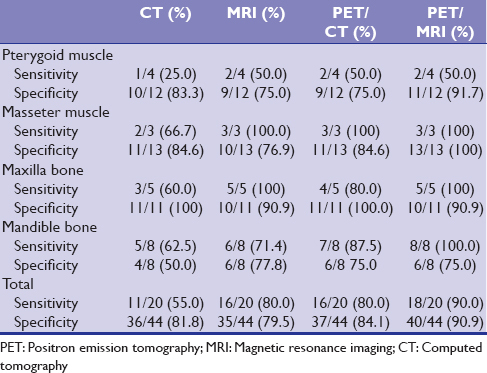 The author compared the results of all four imaging modalities [Table 1]. Table 1: Sensitivity and specificity values for each imaging modality compared by Huang et al. The size of pathological tissue was 4.0 ± 1.2 cm in mean maximal diameter. Different imaging modalities such as CT, MRI PET/CT, and PET/MRI revealed size 4.4 ± 1.4 cm, 4.0 ± 1.3 cm, 4.3 ± 1.3 cm, and 4.4 ± 1.2 cm, respectively. The tumor size estimated by all modalities was almost similar, but PET/MRI was more accurate than the other modalities. With the reference of above-mentioned values, authors concluded that PET/MRI is superior to CT, MRI, and PET/CT to reveal the extent and size of tumor in bone as well as in muscles. Kanda et al. studied thirty patients with oral and hypopharyngeal squamous cell carcinoma retrospectively. The author made a comparison of findings from MRI, PET/CT, and PET/MRI with tumor/node/metastasis staging (proposed by the American Joint Committee on Cancer) [Table 2]. The author concluded that primary tumor was correctly diagnosed with all the three modalities. For tumor size (T staging), PET/MRI and MRI showed better results than PET/CT and nodal metastasis (N staging) was diagnosed more accurately on PET/CT and PET/MRI than MRI. Wiesmüller et al. studied tumor location and standard FDG uptake values in 43 malignant or nonmalignant patients using PET/CT and PET/MRI. Out of 43 patients, 38 revealed same foci on both imaging modalities, 4 patients were revealed by PET/MRI, and 1 was detected by only PET/CT. Totally 94 lesions in 43 patients were used to investigate FDG uptake values. The SUVmax and SUVmean were 22% and 11% lower on PET/MRI than on PET/CT. In this study, PET/MRI and PET/CT performed equally with respect to qualitative analysis. The quantitative analysis showed statistically significant difference between PET/CT and PET/MRI uptake although difference between the two was minor. Boss et al. included eight patients with HNC in their study. First, PET/CT was taken using FDG as radiopharmaceutical agent followed by simultaneous PET/MRI imaging. The uptake of radiopharmaceutical agent was evaluated visually and semi-quantitatively (metabolic ratios) in both normal anatomical structures and in carcinomatous tissues [Table 3]. The author concluded that PET/MRI showed better contrast and resolution of images than PET/CT. The mean metabolic ratios for normal soft tissues showed good agreement between PET/MRI and PET/CT values with a correlation coefficient of R = 0.99. The mean uptake value for carcinomatous tissues was higher for PET/MRI than PET/CT. The correlation coefficient for mean metabolic ratios was R = 0.92 and for maximum metabolic ratio was R = 0.96. The PET/MRI is an emerging modality provides information by simultaneous and sequential methods. The information obtained by PET and MRI is usually complementary to each other. Many authors have reported valuable results from PET/MRI imaging in head and neck tumor cases. PET/MRI better evaluates T staging of carcinoma than PET/CT. The N staging is equally interpreted by both modalities except in the cases where intravenous lymphotropic superparamagnetic nanoparticles are injected, and MRI is taken 24 h before and after the injection. This method helps to detect nodal micrometstasis and hence better than PET/CT., To detect metastasis (M staging) to bone, liver and brain PET/MRI is superior to PET/CT but lung lesions are better detected by PET/CT. The main concern of using PET/MRI is its considerable cost, trained physician in the field of nuclear medicine, trained radiologist, physicist, and technician. This problem is enhanced by dearth of PET/MRI training programs. With technical advancement, it is possible to combine PET/CT and MRI images without affecting the quality of image. Hence, it is a question of debate to invest in a simultaneous PET/MRI machine. During the course of treatment, a patient undergoes PET/CT and MRI imaging multiple times. In such cases, it is beneficial to combine both modalities and hence reduce cost and time of the scan. The 80% less radiation exposure than PET/CT is another advantage of PET/MRI. Newer tracers such as fluoromisonidazole and blood oxygen-level dependent MRI help to identify hypoxic sites in tumors and can be correlated with histopathological report of hypoxia in tumors. Similarly, rubidium and dynamic contrast-enhanced MRI performed simultaneously helps to evaluate angiogenesis and can be evaluated histopathologically. It is difficult to integrate PET and MRI technically, but this technique simultaneously provides structural and functional information. In spite of advancements in imaging modalities, diagnosis in head and neck region is still difficult. A great deal of knowledge of head and neck area (normal, pathological, and posttreatment) and experience is required. Although PET/MRI gives promising results, further clinical researches are required on a large sample size. Rana L, Sharma S, Sood S, Singh B, Gupta MK, Minhas RS, et al. Volumetric CT perfusion assessment of treatment response in head and neck squamous cell carcinoma: Comparison of CT perfusion parameters before and after chemoradiation therapy. Eur J Radiol Open 2015;2:46-54. Calabrese L, Ostuni A, Ansarin M, Giugliano G, Maffini F, Alterio D, et al. Future challenges in head and neck cancer: From the bench to the bedside? Crit Rev Oncol Hematol 2012;84 Suppl 1:e90-6. Becker M, Zaidi H. Imaging in head and neck squamous cell carcinoma: The potential role of PET/MRI. Br J Radiol 2014;87:20130677. Judenhofer MS, Cherry SR. Applications for preclinical PET/MRI. Semin Nucl Med 2013;43:19-29. Hofmann M, Bezrukov I, Mantlik F, Aschoff P, Steinke F, Beyer T, et al. MRI-based attenuation correction for whole-body PET/MRI: Quantitative evaluation of segmentation- and atlas-based methods. J Nucl Med 2011;52:1392-9. Martinez-Möller A, Souvatzoglou M, Delso G, Bundschuh RA, Chefd'hotel C, Ziegler SI, et al. Tissue classification as a potential approach for attenuation correction in whole-body PET/MRI: Evaluation with PET/CT data. J Nucl Med 2009;50:520-6. Hofmann M, Steinke F, Scheel V, Charpiat G, Farquhar J, Aschoff P, et al. MRI-based attenuation correction for PET/MRI: A novel approach combining pattern recognition and atlas registration. J Nucl Med 2008;49:1875-83.
von Schulthess GK, Burger C. Integrating imaging modalities: What makes sense from a workflow perspective? Eur J Nucl Med Mol Imaging 2010;37:980-90. Vargas MI, Becker M, Garibotto V, Heinzer S, Loubeyre P, Gariani J, et al. Approaches for the optimization of MR protocols in clinical hybrid PET/MRI studies. MAGMA 2013;26:57-69. Varoquaux A, Rager O, Poncet A, Delattre BM, Ratib O, Becker CD, et al. Detection and quantification of focal uptake in head and neck tumours: (18)F-FDG PET/MR versus PET/CT. Eur J Nucl Med Mol Imaging 2014;41:462-75. Ratib O, Beyer T. Whole-body hybrid PET/MRI: Ready for clinical use? Eur J Nucl Med Mol Imaging 2011;38:992-5. Zaidi H, Del Guerra A. An outlook on future design of hybrid PET/MRI systems. Med Phys 2011;38:5667-89. Zaidi H, Ojha N, Morich M, Griesmer J, Hu Z, Maniawski P, et al. Design and performance evaluation of a whole-body Ingenuity TF PET-MRI system. Phys Med Biol 2011;56:3091-106.
von Schulthess GK, Kuhn FP, Kaufmann P, Veit-Haibach P. Clinical positron emission tomography/magnetic resonance imaging applications. Semin Nucl Med 2013;43:3-10. Veit-Haibach P, Kuhn FP, Wiesinger F, Delso G, von Schulthess G. PET-MR imaging using a tri-modality PET/CT-MR system with a dedicated shuttle in clinical routine. MAGMA 2013;26:25-35. Iyer NG, Clark JR, Singham S, Zhu J. Role of pretreatment 18FDG-PET/CT in surgical decision-making for head and neck cancers. Head Neck 2010;32:1202-8. Abgral R, Querellou S, Potard G, Le Roux PY, Le Duc-Pennec A, Marianovski R, et al. Does 18F-FDG PET/CT improve the detection of posttreatment recurrence of head and neck squamous cell carcinoma in patients negative for disease on clinical follow-up? J Nucl Med 2009;50:24-9. Eiber M, Souvatzoglou M, Pickhard A, Loeffelbein DJ, Knopf A, Holzapfel K, et al. Simulation of a MR-PET protocol for staging of head-and-neck cancer including Dixon MR for attenuation correction. Eur J Radiol 2012;81:2658-65. Buchbender C, Hartung-Knemeyer V, Forsting M, Antoch G, Heusner TA. Positron emission tomography (PET) attenuation correction artefacts in PET/CT and PET/MRI. Br J Radiol 2013;86:20120570. Nakamoto Y, Tamai K, Saga T, Higashi T, Hara T, Suga T, et al. Clinical value of image fusion from MR and PET in patients with head and neck cancer. Mol Imaging Biol 2009;11:46-53. Huang SH, Chien CY, Lin WC, Fang FM, Wang PW, Lui CC, et al. A comparative study of fused FDG PET/MRI, PET/CT, MRI, and CT imaging for assessing surrounding tissue invasion of advanced buccal squamous cell carcinoma. Clin Nucl Med 2011;36:518-25. Kanda T, Kitajima K, Suenaga Y, Konishi J, Sasaki R, Morimoto K, et al. Value of retrospective image fusion of ¹8F-FDG PET and MRI for preoperative staging of head and neck cancer: Comparison with PET/CT and contrast-enhanced neck MRI. Eur J Radiol 2013;82:2005-10. Boss A, Stegger L, Bisdas S, Kolb A, Schwenzer N, Pfister M, et al. Feasibility of simultaneous PET/MR imaging in the head and upper neck area. Eur Radiol 2011;21:1439-46. Harisinghani MG, Barentsz J, Hahn PF, Deserno WM, Tabatabaei S, van de Kaa CH, et al. Noninvasive detection of clinically occult lymph-node metastases in prostate cancer. N Engl J Med 2003;348:2491-9. Jadvar H, Colletti PM. Competitive advantage of PET/MRI. Eur J Radiol 2014;83:84-94. Afaq A, Syed R, Bomanji J. PET/MRI: A new technology in the field of molecular imaging. Br Med Bull 2013;108:159-71.